44 posts categorized "Chabad & the Media"
Rabbi Dr. David Berger has written a long review of the three new books marketed as biographies of the late Chabad-Lubavitch Rebbe Menachem Mendel Schneerson – Rabbi Joseph Telushkin's, Rabbi Chaim Miller's, and Rabbi Adin Steinsaltz's. Each book omits key facts and downplays Chabad messianism, and thanks to Berger, you can see what these three authors intentionally omitted. A delegation of Chabad rabbinic leaders joined Chabad's Chief Rabbi of Russia, Berel Lazar, for a Holocaust commemoration in Crimea that was organized by Vladimir Putin to use as propaganda to support his illegal takeover of Crimea and his trampling of democracy in Russia. "After Shabbos we learned that while we were dining at the Shabbos table full of guests, the 'rabbi' of the reform temple where Giffords is a member (her father was Jewish) was busy being interviewed by various TV stations. It wasn't until Shabbos ended that we were schlepped into this story." Explaining Chabad: How Did A Small Hasidic Court Become The Worldwide Face Of Judaism? How did a small Hasidic court become a phenomenon that is fomenting something of a revolution in the Jewish world? The 4,000 Chabad emissaries who convened in New York offer a simple answer: energy, motivation, love and tolerance. Pinned Post – In a highly suspicious move, the Times removes content that implicates Chabad in the theft of millions of dollars but does not issue a correction noting that change. Although not a member of Chabad, I have been involved with the organization for three decades. Here are five factors I believe account for its success and the lessons the rest of us can learn from them. Does a book review written by a Jewish Week editor need to be fact based? Or is it okay to lie, especially when those lies benefit Chabad? Why are Chabad.info, Chabad.org and Lubavitch.com indexed as Google News sources? This non-apology apology is from JTA president Elisa Spungen Bildner. Who's she non-apologizing to? You. Postville's Jews: Government Action Against Rubashkin, Agriprocessors A "Pogrom," Blatant Antisemitism"
The Lubinsky-Lewin-Agriprocessors' PR Machine: Kosher Meat "Shortage" Turning Jews Into "Vegetarians"
Getzel Rubashkin Sockpuppet Comments Found Defending Agriprocessors, NCSY-OU, and Baruch Lanner. Comments date back to early 2007. Like many other young men in Crown Heights, Itzik Balulu studies the Talmud and other Jewish texts from early in the morning to well into the night. But you should see his ride. When he's not ensconced in 770 Eastern Parkway, the center of the Chabad-Lubavitch universe, the 26-year-old Israeli and his crew drive around in a blinged-out Cadillac, a regular kandy-kolored streamline baby. Oy vey. Clearly, Rabbi David Eliezrie has no shame. Josef Stalin would be proud. Agriprocessors ran a fully-paid junket to Postville last week so hand-picked rabbis and friendly Jewish journalists could see Agriprocessors in action. Agriprocessors: Hey, We're Immigrants, Too! The bizarre spin of Agriprocessors and its owners, the Rubashkin family of Chabad-Lubavitch hasidim, continues. Moshe Rubashkin was supposed to be sentenced July 16th, and his son Shalom on July 21. But they were not, sentenced and both remain free. How Dishonest Is The NY Times? The ever-cowardly New York Times – a paper that sat on stories of serial child sexual abuse in the haredi community and whose coverage of the massive ICE raid at Agriprocessors has focused mostly on the issue of illegal immigration while largely avoiding detailed reporting on Agriprocessors misdeeds, has wimped out again. Earlier this week, I highlighted two articles on the Agriprocessors Scandal that I believe missed the mark by a wide margin. One was a JTA piece by Sue Fishkoff. A second, less objectionable piece, was from the Forward. The New York Times has a generally good article on the current tensions in Crown Heights. But the Times does screw up big time. What did the Times do wrong? Two major Jewish media stories on the Agriprocessors immigration raid deserve special mention – not for a job well done. What is the responsibility of the Virtual Jewish Library to tell the truth? Google – which has an ad policy many would consider to be draconian – is running an ad for ChabadWorld.net. The ad claims to be for "The homepage for worldwide Chabad-Lubavitch movement" and its headline is reads "Chabad-Lubavitch." Me:How do you handle corrections on your website? Bard: You mean the Jewish Virtual Library? Bard: We correct anything that's wrong. Why? Did you see something that needs correcting? Me: Yes. Does that email address work? Bard: On the site? Yes, sure. Me: You see those emails? Bard: Yes. Why? Did you email us? Bard: What was the correction? Bard: I remember that [email]. What was wrong with it again? Bard: Where did we get the article from? Me: So why didn't you correct it? Bard: We don't assume people lie about their rabbis, we trust [pause] what they say about their rabbis, what Lubavitch says about their own rebbe. I had all I could do not to burst out laughing. Instead, I suggested Bard get in touch with Professor Menachem Friedman, the world's leading academic expert (sociology and history) on ultra-Orthodoxy in general and on Chabad specifically. Bard, who bills himself in part as a historian, replied: "Who's that?" I should add that Bard seems to be a perfectly nice man. I just hope the standards for his Israel work and his Holocaust work are higher than his standards for the JVL website. In this week's glowing Times Magazine profile of diamond/real estate mogul and Chabad Lubavitch benefactor Lev Leviev, there pretty much weren't any negative words to be seen. But it's turning out that there is plenty missing. Like Leviev's failed partnership with Hasidic real estate developer Shaya Boymelgreen, LevievBoymelgreen. Leviev is currently suing Boymelgreen for more than $100 million. Meanwhile, Boymelgreen (a prolific contributor to local politicians) is under fire for constructing uninhabitable apartments and has attracted more than his share of controversy. Strangely, none of this was mentioned in the Times piece. Then there's the fact that, as WWD notes, Leviev had an investment in Vivid Collection, a diamond brand that's been accused of giving bribes to diamond graders. Lastly, the article does not note that Leviev's involvement with Chabad Lubavitch in Russia (where he assisted the sect in gaining official, Valdimir Putin-approved control of the mainly secular Russian Jewish community) is largely due to Russian oligarch/Chelsea owner Roman Abramovich's drafting him in a grudge match with Putin against Russian media baron Vladimir Gusinsky. Pretty much what I said, except Fishbowl says it better. "It's a scandal. It's forbidden to bring worshipers into a broadcasting facility, especially near the news department. It will start with prayers on the High Holy days, continue on regular Saturdays and then there will be a suit filed to stop broadcasting on Saturdays because it disrupts the service. So long as people sought a prayer corner in the workplace it was okay. Now they're starting to say they will pray in the Nakdi studio. Because the whole residential area around the authority is religious, who knows how it will end." "Bringing a Torah scroll to the heretical Broadcasting Authority is a great victory," Ba-Gad said. "Just like how the Satmar Hasidim did to the Zionists last week when they laid the cornerstone for their institutions on the ruins of the Edison Theater." "It is possible that we should have invited all the representatives. The next time there is an even more important event, the arrival of the Messiah, we will learn the lesson and invite the leaders of all the factions. This really was a mistake on my part, because every Jew is connected to the Torah." So let's recap. The Chabad follower-journalist uses state backing to hold a Torah dedication ceremony for the state Broadcasting Authority synagogue, which is housed in his office. He invites to this state ceremony only Orthodox religious politicians. Those politicians – who control funding for the Israel Broadcasting Authority – make speeches that can easily be seen as divisive and anti-secular. (former MK Ba-Gad's remark was only one out of many similar remarks made by these Orthodox politicians.) When a reporter asks the Chabad follower-journalist why he failed to invite non-religious politicians like the heads of Likud and Meretz, the Chabad follower-politician answers in a condescending manner. Should the IBA even have a state-sponsored Orthodox synagogue? I don't think so, in part because I oppose any state-sponsored religious activity and in part because this synagogue is particularly Orthodox. Israel has Jews who are religious but not Orthodox. Should the IBA therefore have an egalitarian synagogue, as well? A Karaite beit knesset? A prayer room for Sabbateans? These questions are valid for all the various state ministries and arms that have state-sponsored synagogues, but they are especially valid when dealing with the IBA which, after all, is expected to accurately report the news for all Israelis, whether or not their representatives were invited to the IBA's state-sponsored Torah dedication ceremony. The article makes no mention of the pro-democracy Jewish leaders who have been forced to flee Russia, and it makes no mention of Putin opponents who now languish in jail or who were murdered. It also mouths exactly the line given me by a Chabad shaliach last week. …Mark Levin, executive vice president of the Washington-based NCSJ, said he heard similar defenses of Putin and his policies from unnamed Russian Jewish leaders during a visit to Moscow last month. Nevertheless, Levin noted, many of the same leaders were not displeased that he and other members of the NCSJ delegation raised concerns about the erosion of democracy during meetings with high Russian government officials. The erosion of democracy in the FSU is due in part to the US's distraction with Iraq. But the Bush Administration was also swayed by strong Jewish support for Putin, support led from Putin's first day in power by Berel Lazar. How did Lazar get this power? In back room political deals meant to marginalize Putin's opponents and pro-democracy advocates, deals brokered by oligarchs close to Chabad. Putin gives these men access and unrestrained ability to retain and grow their wealth. They give Putin money and a 'good face' in the West. Who was tapped to provide that 'good face'? Chabad. In return for this service, Chabad got control of the FU's Jewish community, including much real estate. Putin recently compared the US to Nazi Germany. He has killed, jailed or exiled most of the opposition and cracked down on religions other than the Orthodox Church. But Putin is "good for the Jews," as one Chabad shaliach recently told me, and that is enough. But is it enough? I do not think so. I think a time will come, perhaps very soon, when that will become clear, even to court Jews like Berel Lazar. For centuries, the role of the Jewish people as a "kingdom of priests" (Exodus 19:6) calling humanity to the worship of the one God was suspended. In our day, thanks to the growing interest of non-Jews in Judaism, that has started to change. Matisyahu may be the best example of a Jew ministering in this priestly role on a mass scale. His efforts, however, have won him Jewish detractors, who prefer that Jews remain anonymous or irrelevant. Take, for example, the sniping from the peanut gallery coming out of the consistently sour but readable blog FailedMessiah.com: "What Matisyahu does is unseemly. Few, if any, significant poskim (rabbinic legal scholars who rule on Halacha) would approve. But what bothers me more is blatant trading on Kaballah and Hasidut to make money. That this does not bother mainstream Chabad may be because this is what mainstream Chabad has itself done for years." I am certainly not opposed to Jews being a light onto the nations in an active fashion. What I and many other critics of Matisyahu are concerned about has been clearly stated on this blog. Being a light onto the nations or a need to remain "under the radar screen" is not one of them. Klinghoffer ignores the fact that poskim do not allow what Matisyahu does, and that poskim from Chabad, while the Rebbe was alive, told musicians they could not do what Matisyahu is now doing. Messianism has not gone away, as even any casual observer of Chabad knows, It is dominant in Israel, France, the FSU, and in Crown Heights. Matisyahu himself is a messianist. Klinghoffer brushes away these facts just as he brushes away Marvin Schick's concern about the lessening religious standards in Chabad, something there is much proof for. He also makes it appear as if Schick is an enemy of Chabad, something that is absolutely false – although, to be fair, Klinghoffer may not know this. How can Klinghoffer make claims that disregard fact? I'll give you my personal answer. Klinghoffer is a devotee of Rabbi Daniel Lapin, the maverick Orthodox rabbi shunned by many in mainstream Modern Orthodoxy and by most in the haredi world. Lapin has made a career (outside of his business involvements, which have been, in some cases, highly questionable from a legal standpoint) of supporting right wing political causes (he is one of Jack Abramoff's rabbis) and of "kashering" the religious and extremist right*. To do this, one needs to adopt an ends justify the means theology, which is just what Lapin has done. And this theology drives his disciples, as well. Several years ago, WorldVision launched a campaign to aid those hurt by suicide bombing and terrorist attacks in Israel. The radio commercial had bombs exploding, sirens wailing. Where was the money going? To the West Bank and Gaza, and only to Arabs. I asked WorldVision why. A spokesperson responded by saying (I paraphrase) that WorldVision helps the most at need. Jews can take care of themselves. The Arabs cannot. I asked about the morality of using terror attacks against Jews to raise money for Arabs. Terror hurts both sides, was the response. The Salem Radio Network had a joint campaign with WorldVision to fund this very project. Ads for it ran during both the Dennis Prager and Michael Medved shows. In effect, both shows raised money for the extended families of suicide bombers. I contacted both hosts and explained the problem. Both wanted details that involved many hours of research. I did that research (without pay) and sent the information to Prager and Medved. Prager** banned all ads for that WorldVision campaign from running during his show. But what did Medved, whose rabbi-guru is Lapin, do? He increased the ads and began endorsing that very WorldVision project. Why? I believe for the same reason Klinghoffer can so easily ignore fact. The ends justify the means. *** It wasn't worth damaging his (and Lapin's) relationship with the evangelical-owned and operated Salem radio over the WorldVision project, especially because WorldVision is a major powerhouse in the evangelical world and is, not surprisingly, a major advertiser on Salem stations. Klinghoffer is a follower of Lapin. To the extent that his article reflects that relationship, it is Lapin – and his theology – that is to blame. The same is true for Medved and WorldVision. If well-meaning Chabad supporters would focus on keeping Chabad within halakha, instead of kashering every instance of deviation from it, Chabad would be in much better shape, and blogs like Failedmessiah.com would not need to exist. *Evangelical and other Christian Fundamentalist theology, as it impacts the public square, is not necessarily incompatible with Judaism any more than it is automatically compatible. For example, while Judaism frowns on abortion, it does not ban abortion outright and allows (and sometimes mandates!) abortion for a host of reasons related to the physical and mental health of the mother. This is why many poskim (like some of those ignored by Klinghoffer) do not support the anti-abortion movement. Lapin goes beyond this position to, in effect, kasher all but the most blatantly anti-Jewish positions of evangelicals. **Yes, it is true that Prager is also a supporter of Chabad. But Prager is not Orthodox, and his views on halakha are not close to Orthodoxy's. ***By ends in this case I mean ideological ends, not financial gain. In other words, in this case the ends are "ohr lagoyyim" and the means, Matisyahu and Chabad. Rabbi Lapin considers ohr lagoyyim to be a cornerstone of his public work and ideology/theology. National Geographic has a photo series on Chabad in Crown Heights. Note the picture of the parochet has been cropped to cut out the "Yechi" slogan, and somehow, none of the photos have any "Yechi" material in them, even though it is very common throughout Crown Heights and in 770 itself. The price an outside photographer pays for entrance? High. The extent of the Chabad network, with 4,000 centers in 70 countries, is unprecedented in the Jewish world and is difficult to explain in conventional sociological terms. The expansion continued despite the loss 11 years ago of its renowned spiritual leader, Rabbi Menachem Mendel Schneerson, who championed the cause of bringing Jews together and under whose direction Chabad became famous for its aggressive marketing of Judaism. Chabad's growth is not all that difficult to explain. Shlichus (Chabad 'missionary' work) is a jobs program. It is the family business and the family calling all rolled up into one. When the Rebbe died he left hundreds of teenaged students whose only training and only aspiration was to be a Chabad shaliach. The family business expanded to accommodate them. This, combined with the opening of Russia and the FSU and oligarchs who quickly saw the advantages of having Chabad on their side – and the very real disadvantages of the opposite – explains much of Chabad's growth. But numbers of centers do not tell the whole story. Many centers are operational only in the most restricted sense. The shaliach raises money and does a few – very few in some cases – programs that attract only a tiny number of people. Another Chabad "center" shows on the map, but few people are influenced or helped. This "center" helps Chabad's overall PR image at least as much as it helps local Jews. Chabad has recently underscored efforts to shake off the messianic image that has adhered to certain sectors of the movement; it has rejected out of hand the extreme sect that has transformed Schneerson into the messiah. The organizers of the New York convention went out of their way to express their opposition to messianic elements. Really? Can we see that "rejection" in writing, please? Messianic signs, banners and flags fill Chabad communities worldwide. Chabad's major educational and religious institutions are controlled by messianists. Chabad institutions in entire countries are dominated by messianists. So where is the "rejection," Dr. Becker? But, more to the point, Chabad's "anti"-messianists do not themselves reject the view that the late Rebbe is the messiah – far from it. They reject publicizing that view, because that view hurts fundraising and outreach efforts. No major "anti"-messianist leader has ever said publicly that the late Rebbe is not the messiah – and none ever will. Chabad is expert at using naîve secular Jews, like Dr. Becker and Alan Derschowitz, as its "kashering agents." Chabad is successful at this largely because the Jewish media fails to do its job. Just as it provides minimal reporting on the activities of the Federations, which, after all, are "representative" of all Jews, it provides far less hard coverage of Chabad, that represents so few. But Chabad has changed the theology of Judaism in ways that demand our attention. Asking a dead man for blessing and advice – and expecting and "receiving" an answer – once the sole purview of polytheistic religions, is now a mainstay of Judaism.The focus on the personality and charisma of a supposed messiah now surpasses the deeds that messiah must do to be authentic. And a second coming of the messiah – once an exclusively Christian concept that marked the divide between Christianity and Judaism – is now a standard Jewish belief. But these are theological issues, issues that effect the heart and soul of Judaism, not its pocketbook and stomach, and as such they are lost on the Steinhardts, Derschowitz's and Beckers of the world, who care more about nostalgia and warm cholent than they do about truth. Once upon a time in a land far away, truth mattered. But no more. The late Lubavitcher Rebbe was the subject of a groundbreaking three-day conference at New York University this week, a generally laudatory program that could set the tone for how the charismatic leader and his movement will be presented in future academic settings. "What we are really going to do [with this conference is] set off a mode of research," said the event's organizer, Lawrence Schiffman, a Judaic studies professor at New York University. The conference, he added, was "in certain ways a communal research project." 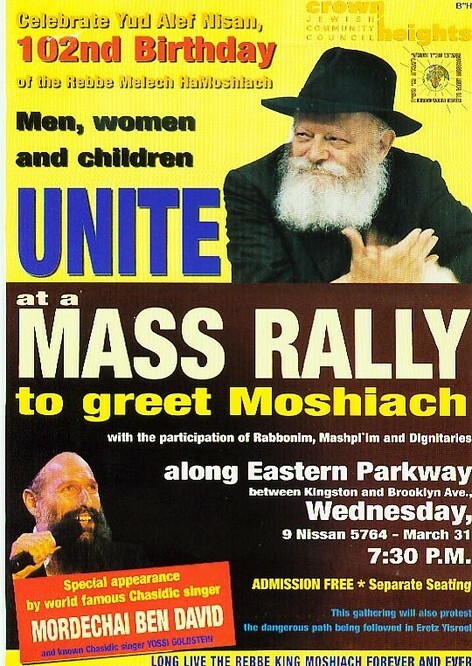 Several of the sessions featured basic introductions to the rebbe, Rabbi Menachem Mendel Schneerson, and the Chabad-Lubavitch Hasidic movement's basic rituals and slogans, including its trademark declaration: "We Want Moshiach [Messiah] Now." Many presenters also offered detailed explications of Schneerson's thought. These were based on a review of his extensive writings, which are relatively unfamiliar to Jews outside of Lubavitch circles. Most speakers steered clear of any criticism of Schneerson's theology or leadership. In fact, one of the Lubavitch movement's harshest critics, Queens College history professor David Berger, received as much criticism as Schneerson himself. Organizers did not invite Berger, whose 2001 book, "The Rebbe, the Messiah and the Scandal of Orthodox Indifference" (Littman Library of Jewish Civilization), is the most prominent attack on the Lubavitch. Berger has argued frequently that the Lubavitch movement has put itself beyond the pale of Orthodox Judaism by allegedly encouraging followers to see Schneerson as the messiah and to worship him as if he were divine. As a result, Berger said, Orthodox rabbis and organizations should boycott Lubavitch rabbis and institutions. Professor Shaul Magid of Indiana University Bloomington said in his presentation that Lubavitch assumptions about Schneerson's immortality can find root in Jewish sources from the pre-rabbinic, pre-Christian era. "David Berger is right that it is not Orthodox, but he's wrong that it is not Jewish," Magid said, adding, "An indictment of heresy against contemporary Chabad is an indictment against the entire system of Chabad, as well as perhaps Kabbalah generally." Schiffman defended the decision not to invite Berger, saying, "I think he'll be the first to tell you that he's not interested in approaching this topic from an academic perspective." Berger told the Forward, "I have good reason to believe that I was not invited because of the controversial nature of my involvement in this matter, and a reasonable case can be made that a fierce partisan is not an appropriate participant in an academic conference." But, he added, "At the same time, one has to be careful of partisanship on the other side that obscures the problems -- to put the matter moderately -- that mark the aftermath of the rebbe's career." The conference featured a mix of Lubavitch and non-Lubavitch scholars. One Chabad participant, Chaim Rapoport, said the approach at the conference was quite different from what you would find at a Lubavitch Yeshiva. "The academic style, in essence, is the study of a subject -- it's very detached," Rapoport said in an interview with the Forward. "With the rebbe, there'd be a sense of awe" if his followers had run the program. Despite the academic setting, repeated iterations of nonacademic assessments entered the discussion. For instance, Lubavitch scholars frequently answered questions posed to the non-Lubavitch scholars, basing their answers on personal experience and understanding as opposed to academic research. And a sense of awe was detectable in nearly all the presentations dealing with Schneerson and his work; there wasn't much criticism, not even from non-Lubavitch scholars. Schiffman acknowledged as much, saying, "People are amazingly impressed by most of the record" of his work. "When you get a literature going [about Schneerson], maybe people will be more critical," Schiffman said. "You have to start somewhere." The most critical assessment of the Lubavitch came in a presentation by Tufts University professor Stephanie Wellen Levine. Professor Levine had studies the Lubavitch community while living in it, and this lead to her 2003 book, "Mystics, Mavericks, and Merrymakers: An Intimate Journey Among Hasidic Girls" (New York University Press). In her presentation, Levine discussed the Lubavitch youth who had abandoned ritual observance. As she recounted the story of one young woman who had started seeing a non-Jewish man, a distinct murmur grew in the audience. One Lubavitch woman left the presentation so quickly that she forgot her purse. create a "distortion" leading to "moral nihilism." In an interview with the Forward, Lamm asserted that such open efforts to declare Schneerson the messiah would not have been tolerated before his death. "When he was alive, no one would have dared to discuss this," Lamm said. While Lamm's presentation was an unexpected deviation into the topic of Lubavitch messianism, the topic was the subject of the conference's final session. During the session, Naftali Loewenthal, a professor at University College, London, explained how a Chabad theology could exist that did not consider Schneerson to be the messiah. In another presentation at the final session, Professor Avrum Ehrlich of Shandong University made the case for why messianism was an essential element of Schneerson's thought and the Lubavitch movement's development. None of the presenters at the conference attempted to define the Lubavitch movement's current understanding of messianism that has developed since Schneerson’s death or quantify how many Chabad followers believe that Schneerson is the Messiah. "The fact of the matter is that there's no way to get the information in a reliable manner," Schiffman said. "The only way to get that information is by spending a large amount of money on a study, but even then, you don't know how to interpret what they're saying" because of the doctrines of esotericism within the sect. More on the conference here. More on the Forward's coverage of Chabad here. Three-day conference at NYU explores philosophy, mysticism and messianism. Scholars probed the contributions of the late Lubavitcher rebbe, Menachem Mendel Schneerson, at a first-of-its-kind conference held earlier this week at NYU. “Reaching for the Infinite: The Lubavitcher Rebbe – Life, Teachings and Impact” was more apt a title for the conference that took place this week at New York University than even its organizers may have realized. Trying to convey the impact of the late Rabbi Menachem Mendel Schneerson in two dozen or so 20-minute academic presentations, which were delivered at the conference held Sunday through Tuesday at NYU’s student center on Washington Square, was a little like reaching for the infinite with arms only inches long. This was the first-ever academic conference devoted to the life and work of Rabbi Schneerson, who led the Chabad movement from 1951 until his death in 2004, and helped it grow into the largest Jewish outreach network in the world. Held under NYU’s auspices, the meeting was funded by Chabad supporters George and Pamela Rohr, and Craig and Deborah Cogut, and attended by up to 150 people at a time, ranging from Lubavitch chasidim to Reform rabbinical students. 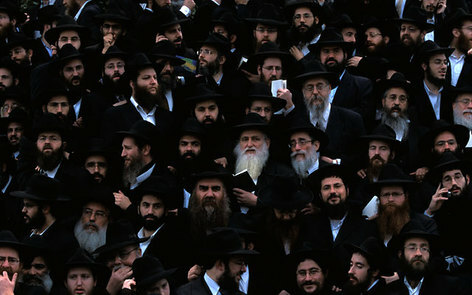 There may be no other 20th century rabbi as influential, recognizable — or controversial — beyond his own religious community as Rabbi Schneerson, whose reputation has been somewhat diminished by the controversy surrounding the insistence by many of his followers that he is the messiah, a dispute that has divided his chasidim. Speakers’ approaches and topics varied widely. Some focused on esoteric aspects of the rebbe’s particular take on kabalistic ideas, some on his Torah scholarship and others on his involvement with politics, both domestic and Israeli, or with art, music and psychology. Several speakers were Lubavitch chasidim in academia, and others, including Schiffman, can be described as friends of the non-messianist leadership faction of Lubavitch. While Chabad’s most reviled critic, Brooklyn College professor of history David Berger, was purposely left off of the panel, another longtime critic of messianist aspects of the movement, Allan Nadler, a professor of Jewish studies at Drew University, was invited to participate. His presentation, “Mitnagdic Opposition to the Rebbe,” wandered into opposition by other chasidic rebbes as well, and delved into how it played out in Israeli party politics. Rabbi Norman Lamm, retired president of Yeshiva University, who spoke on “The Rebbe, Mysticism and Philosophy” on Tuesday, was the first to address Lubavitch messianism head-on. But he also sharply criticized the messianic thrust that the public face of the movement seems to be increasingly taking. “I do not believe that the rebbe thought himself to be moshiach. But I do think he considered himself a possible candidate,” said Rabbi Lamm. He decried the movement’s “over-emphasis on messianism” and castigated those who now say that the rebbe is the messiah but simply concealed from view. He protested their reductionist, myopic focus and called their opponents, who run many of the movement’s institutions, “the spiritual elite” of Lubavitch. William Helmreich, a professor of sociology and Judaic studies at the City University of New York, may have best summed up the rebbe’s complexities when he used his presentation on “The Rebbe’s Relation to Jewish Communal Organizations and Religious Movements” as an opportunity to portray him as a man of paradox. For example, the rebbe seemed “flexible yet his official stance was opposed to contamination by the outside world. He had friends in every denomination but opposed cooperation,” he said. In other words, performing a mitzvah was not simply a first step, but something of infinite inherent value whose worth could also echo in higher worlds. The rebbe believed “that Judaism changes, that revelation is continuous and progressive, therefore our age deserves new approaches in order reach everyone. He asserts that we are not Godless moderns based on the Enlightenment, but that now God is closer than he ever was before.” The rebbe’s goal, he said, “was to bring 20th century Judaism away from materialism. It was rare in 20th century religion to describe America as full of meaninglessness, neurosis and laziness,” as the rebbe did, Brill said. Jeff Shandler, an associate professor of Jewish Studies at Rutgers University and a maven of American Jewish culture, spoke about the rebbe and media. And indeed it was video of the rebbe that provided one of the conference’s most compelling moments, during a presentation on the rebbe’s relationship to music by Mark Kligman, a professor of Jewish musicology at the Reform movement’s Hebrew Union College-Jewish Institute of Religion. When he played old videotape of the rebbe, from 1973 and 1980, singing a Lubavitch niggun (wordless melody), everyone in the conference room was riveted. Because it took that grainy black-and-white footage of the rebbe singing, and hundreds of his followers around him responding as one, to finally reveal what all the academic presentations simply could not: the power of the rebbe’s charisma. Early in his paper, Professor Wolfson avers that "the secret of the secret"…is that "in its most inwardness, the soul is conjoined to divinity…the soul is consubstantial with God," and refers to this as "an insight that significantly closes the gap separating the human and the divine, a gap that is typically assumed to be a basic tenet of Biblical and rabbinical Judaism." Is this not easy to distort into justification that the Rebbe as Messiah is part of the Godhead? …is it not easy to find in this concept a "source" for a kind of Sabbatian antinomianism and moral nihilism — especially if one believes moshiach has arrived, in the form of Rabbi Schneerson? I wonder if this distortion could and should have been avoided by responsible leadership of a movement that has not lost its vitality. And that too is a serious question: is the continued vitality somehow connected to the underlying esoteric theology of the movement in its most radical form? But I proposed that it is academic, at least as far as moral philosophy is an academic subject, and Wolfson replied "you're right." Something is very rotten in NYU. What will not be seriously discussed at NYU's Rebbe conference? Birthday gatherings like the one advertized on this poster. NYU is hosting the first academic conference on the Rebbe in the US. Bar Illan held a similar conference three years ago. So, who is covering this year's NYU conference? Steven I. Weiss, the reporter who strongly downplayed Chabad messianism in his coverage of the Rebbe's 10th yartzeit 16 months ago. Weiss is also on record as believing Chabad references to a living Rebbe ("Yechi adonaynu moreynu v'rabaynu melech hamoshiach l'olam voed!" , "The Rebbe, shlit'a", "The Rebbe, he should live many long and happy days", etc. ) to be allegorical and therefore not a problem halakhicly. Is Israeli Politics Ever Out Of The Discussion? Yesterday, Allan Nadler presented a paper on Mitnagdic Opposition to the Rebbe that quickly became about how the various ultra-Orthodox groups came into conflict, with Israeli politics as part of the conflict; that’s when my eyes glazed over. At the end of the talk, back into consciousness, Yaakov Ariel of North Carolina — an Israeli — contradicted Nadler not on anything that explicitly furthered knowledge of the main topic, but about Israeli politics. Rabbi Berger was not invited, apparently because Schiffman, Wolfson and Lowenthal (a Chabad rabbi) consider him to be a "polemecist" against Chabad. Yet those who are academic polemecists for Chabad – like Schiffman, Wolfson, and Lowenthal – fill the schedule. The Rebbe's only biographer was also not invited. (He's on the outs with Chabad.) Schiffman admits to liking his work but, he's not an academic, so no invite. Steven I. Weiss has a post on Rabbi Dr. David Berger explaining his current position on Chabad. Rabbi Berger also notes that he was not invited to present at NYU's academic conference on the Rebbe to be held next week. The conference – organized by Chabad apologist Lawrence Schiffman and Chabad rabbi Dr. Naftali Lowenthal, and funded by Chabad supporter and apologis George Rohr – appears to have only two potential critics of Chabad out of perhaps a dozen or so presenters. The only biographer of the Rebbe, Rabbi Shaul Shimon Deutsch, has also been left out of the mix. This may be because, unlike Rabbi Berger, Deutsch is not an academic. Still, he has the only biography in existence, and has broken new ground with his work. Both Berger and Deutsch are pariahs within Chabad; this may be the real reason neither is presenting. The lone critic of Chabad on the agenda is Alan Nadler, an academic expert on the Vilna Gaon and mitnagdim. SIW is covering this event for the Forward. If his recent comments and his history of reporting on this issue are any indication, Chabad will get off easy – but not too easy. But Chabad doesn't have to worry. Their mole at the Forward will eventually take care of matters by deleting Weiss reports from the Forward's website. Do Missing Articles And Weak Apologetics Prove Media Cover Up? I'm sad that some of my previous reporting of this is missing due to the inexplicable removal (to no one's apparent knowledge) of some of my items from the Forward's Website; maybe I can find some useful nuggets in my notes. This is nothing new. Articles that contain unfavorable reports about Chabad have also disappeared from other news websites, including Ha'aretz and the Jerusalem Post. The New York Jewish Week ran coverage of the 10th yartzeit that was edited – without the reporter's knowledege or permission – to minimize reports of messianism. References to messianic activity that dominated Chabad's main synagogue were change to read "the basement synagogue," in order to incorrectly leave the impression that the small 2nd floor shteibel (small chapel) where little open messianism was evidenced was somehow the large, main synagogue in Chabad headquarters. The second floor chapel can legally hold about 100 worshippers. The main synagogue, which fills the basement level of the building, can legally hold several thousand. But my conversations with messianist and non-messianist Lubavitchers have shown a wealth of possible meanings for terms like "shlita" or songs like Yechi (indeed, some Lubavitchers have commented on Miriam's original post to this effect). There's a lot to everyone's theology — especially a chasid's — and a plain, literal reading of whatever texts one's found them displaying likely doesn't get the job done. Now, call me crazy, but when I see a video that doesn't indicate some actual physical presence, and a literal, outsider reader reading of a caption says it does, I'll tend to default toward an allegorical reading. Shlit"a is an acronym for , "May he live many long and good days." Yechi is the Chabad chant referring to the late rebbe that is uttered in Chabad prayer services and gatherings, and which is also found as a slogan printed on pictures, posters and billboards featuring the photograph of the late rebbe. It translates, "Long live our master, our teacher, our Rebbe, King Messiah, forever and ever." What Weiss does not realize is his apologetics are no different from the apologetics used by Shabbatians defending their rebbe, Shabbatai Tsvi, and Shabbatian practice. He also passes on the significance (or the mention!) of the Rabbinical Council of America's statement condemning Chabad messianism. The RCA is the largest Orthodox rabbinical body in North America. So, do missing articles containing information unflattering to Chabad, along with the naiive apologetics of an up-and-coming Jewish jounalist prove media bias and deception? History will (eventually) tell. The Chabad movement has been given lots of Channel 1 coverage as of late. A month and a half ago, the channel aired "The Emissaries," a film about the annual convention of Chabad worldwide emissaries held in New York, in which reporter Itai Rappaport not only documented the event, but also served, according to his own testimony, as something between a journalist and an enthusiastic supporter of the movement. The Friday evening current events program, "Diary of the Week," recently broadcast a report by veteran Channel 1 documentary maker, Uri Goldstein on the messianic stream of Chabad and its violent activity against the disengagement. Two days later, a report by Uri Revah was broadcast that appeared to to correct the impression left by Goldstein's report by presenting Chabad's mainstream as calling for non-violent action. Behind all this coverage is a complex network of relationships between the movement and several Channel 1 figures, most notably director of Israel Television, Motti Eden. "The Lubavitcher Rebbe [late head of the Chabad Movement] perhaps is dead, but his spirit has been reigning at Romema [Israel Television's headquarters] ever since Motti Eden became director of Israel Television," is how a senior editor at Channel 1 described the phenomenon. This, of course, is not the first time the Israel Broadcasting Authority has been influenced from the outside. There have been a long series of political attempts to impact the IBA's agenda throughout the authority's existence. However, not all of the Chabad membership is pleased with the stepped-up exposure due to the internal conflict within Chabad in recent years: On one side is the mainstream of the movement, while on the other, there is the Messianic stream that believes the Lubavitcher Rebbe is the Messiah (and therefore, does not acknowledge his death), and has become involved in extreme right-wing activity. This group is primarily identified with those members who are newly observant. According to a number of Channel 1 and Chabad sources, Eden and Revah identify with the Messianic stream. Eden, who was surprisingly appointed Israel Television directory in November, 2003, has a picture of the Lubavitcher Rebbe hanging in his office. This is just one sign of the deep connection that Eden, to which he himself testifies, has with the movement and its late leader. At television directorate meetings, even during the days when deposed IBA director general Yosef Barel was in command, Eden often recounted a meeting he had with the Lubavitcher Rebbe at which he promised him that eventually he would be Israel Television director. Eden even claims he has a recording of the rebbe's statement. A Channel 1 source said that at directorate meetings, participants have started to joke that Eden's' appointment was made by "the Messiah," since everyone knew Barel was behind the move. In the end, a Shas representative on the board of directors, Amram Melitz, tipped the scales at the last moment in favor of Eden, who ran against Amnon Nadav for the position. At the beginning of last month, Goldstein set out to prepare a report for "Diary of the Week" on what is transpiring in the Chabad movement. He went to Safed, among other venues, where he documented movement members who believe the rebbe is still alive and are conducting violent activities against the disengagement. Goldstein also spoke with city residents who complained about the violence perpetrated by the Chabad members, and how they have become a local nuisance. Channel 1 sources said that prior to the broadcast, all of the normal pressures experienced at every news desk began: there were calls from the Chabad spokesman and movement officials trying to prevent the broadcast. Eden demanded to see the report before it was broadcast, but because he was not in the building, the soundtrack was played to him over the telephone. At the end of the conversation, he ordered cutting one sentence uttered by a Safed resident who said the Chabadniks are "haters of secular people." Just two days elapsed after the broadcast of Goldstein's report when the weekday evening news program "Mabat" broadcast Raveh's report, which delivered an altered picture. Chabad Spokesman Menachem Brod denied that he had applied pressure not to broadcast the first report or to broadcast a revised report. Raveh is at the center of criticism as to how Chabad is covered in public broadcasting. Raveh was a reporter for Channel 2 News, and after becoming newly observant, he served as the spokesman for Asher Ohana, who served as religious affairs minister on behalf of Shas in 2001-2003. He then returned to reporting, this time for Channel 1's Religion and Heritage Department. The assumption at Romema is that in the spirit of the way things were run during the Barel era, this gesture was made to strengthen ties with Shas. Barel has refused to talk to Haaretz. Raveh began to work under a personal contract at the heritage department three years ago. With time, and with Eden's encouragement, he became an occasional news reporter on religious matters, mainly the Chabad movement. News editors said that time after time they have had to stop reports that trumpet Chabad religiously and politically. However, sometimes, due to their heavy workload, they do not succeed stopping materials not worthy of broadcast. "He says that he is going to do a color item on the hakafot (dancing with the Torah scrolls) in Kfar Chabad at Sukkot, and then along comes a report that is a screed against the disengagement and the agreement with the Palestinians, because the rebbe said it is forbidden to give up territories," an editor said. In this case, the report was disqualified for broadcast. "His whole attitude toward religion is only through the glasses of Chabad," another editor said. "He is incapable of doing a report in which there is an ounce of professionalism, because he is entirely committed. The day before Oded Ben-Ami's Channel 2 scoop on Rabbi Mordecahi Eliyahu's opposition to the disengagement, Uri Raveh went to see Eliyahu, and what did he interview him about? About a clock from the time of the Baba Sali. This was broadcast on the news." A year ago, Raveh prepared a report on rabbis who "cure" homosexuals, which was broadcast on "Diary of the Week" and aroused anger at Channel 1. "The very choice of the topic for the report legitimizes the claim that homosexuals are sick people," a Channel 1 source said. "This is journalism that testifies to ignorance." Raveh's conduct irritates employees at the channel in other ways as well. His office in Romema serves as a synagogue where Gemara lessons and prayers are held. On Fridays, Raveh roams the corridors, accompanied by young Chabad members, and distributes wine and Sabbath candles. "His activity at the IBA is missionary," a Channel 1 reporter said. "He goes around to the various rooms, and tries to wheedle people into putting on tefillin (phylacteries) and putting up mezuzot. There is no doubt that this sort of activity is not appropriate at a public workplace. There was always the accusation that the religion department was a branch of the National Religious Party. Raveh does not even try to hide the fact that he is a Shas person. This is done in a crude way, and is known to everyone." The third rib of the triangle of Chabad sympathizers at Channel 1 is the head of the news desk in the north, Itai Rappaport. The thoroughly secular Rappaport grew close to Chabad after covering Rabbi Moshe Eurechman, a member of the movement involved in charitable activity in the Krayot area, whom he eventually befriended. On a private visit to New York, Rappaport reported in his film "The Emissaries," Eurechman invited him to the annual convention of 4,000 Chabad emissaries who come from all corners of the world. Rappaport, by his own account, was captivated by the project, and decided he wanted to make a documentary film about the event. Chabad provided him with a film crew, meaning that the production was paid for by the movement, not the IBA. When Rappaport returned and wanted to edit the film, the IBA technicians' committee refused to agree, since the film had not been made by Channel 1. Eden, however, pressured the group to agree that the film be edited. Eventually, the film was not only edited, but also broadcast. However, the channel's technicians have since boycotted Rappaport, and therefore, he has not prepared a report in recent weeks. "The Emissaries" is a fascinating document, if only because of a look inside the world of the movement's emissaries that was made possible thanks to his Chabad contact. Rappaport documented the pilgrimage to the Lubavitcher Rebbe's grave, filmed the rebbe's library, which includes ancient holy books, and participated in the final evening celebration, a banket. Toward the end of the film, Rappaport appears, joining the circles of dancing Hasidim. "We journalists develop cynicism, defensive walls and look at everything from the sidelines," he explained during a discussion of the film held in the studio. "It is impossible to remain indifferent in face of the ecstasy. This is about thousands of people dancing with tremendous fervor and lightning in their eyes. You enter into it." He ended the broadcast with an emotional recommendation: Every Israeli who goes to New York should visit the home of the Lubavitcher Rebbe, otherwise "something will be lacking from his visit." A rare scene occurred during the studio discussion: Brod, the Chabad spokesman, appeared more restrained than Rappaport, the journalist sitting next to him. The moderator of the discussion, Shlomi Goldberg, nevertheless tried to touch on painful subjects, such as the schism in the movement between the moderates and the messianics. Brod acknowledged that "there are various opinions, but the love of the Jewish people is above everything." But Rappaport had never heard of this. "I looked for the differences of opinion, and I didn't find any! I looked, and I didn't find any! At the emissaries' convention there are no differences of opinion, there is fraternity." A veteran Channel 1 reporter said: "Rappaport should have been boycotted by the journalists' committee, and not by the technicians, for this performance." The IBA did not give permission to interview reporters Uri Raveh and Itai Rappaport. As a result, Israel Television Director Motti Eden responded to questions directed to them. Concerning his closeness to Chabad, Eden stated: "I am acquainted with all the streams in Judaism, and am a friend of many of the various streams. I interviewed the Lubavitcher Rebbe in a first journalistic interview 25 years ago." Concerning Eden's intervention so that a report would "correct" Uri Goldstein's report, Eden said: "I do not send reporters on assignments. The person in charge of this task are the editors of "Mabat," the program editors or the reporters who initiate reports themselves." Concerning Raveh's identification with Chabad, Eden stated: "I have no knowledge to the effect that he belongs to any stream. He is a Jew." Eden also addressed criticism about Raveh's work: "Uri Revah's reports, items and films deal with a variety of Jewish topics, not only with Chabad. The only authorities to whom Uri Raveh is required to give an accounting to on his reports are the news broadcast editors and the heritage department editor. The director of Israel Television is the highest professional authority at the television station and not a rabbinical authority." Concerning the turning of Raveh's office into a synagogue: "It is well know that at the IBA there are many Jewish employees, and if a Jew wants a synagogue, he will have one. Uri Raveh's office, with respect to the matter at hand, also serves as a synagogue." Concerning the criticism of Rappaport's work on the film "The Emissaries," Eden stated: "Even a journalist is allowed to relate to people he meets. And if they do good deeds for others, then it is alright to relate to this, as do many reporters with regard to topics they cover." The Klass family, publishers of The Jewish Press. The best example of skewed coverage is coverage of the Rebbe's 10th yartzeit last year. Papers, most notably the NY Jewish Week, portrayed the messianists as a tiny faction, the anti-messianists as the vast majority, messianism as dying out and the movement almost healed from what "some called" a split. Of course, in the weeks after that coverage the fight for control of 770 began, followed by it's related cout case, messianists were elected head of the Crown Heights Community Council and as 770's gabboim (management), and then messianists rebelled – and won – over Chabad's reaction to Disengagement. Messianists control the Chabad street in Israel, France, Russia and Crown Heights – just as they did when coverage denying that was written. Further, even Chabad anit-messiansts believe the late Rebbe is the messiah. The argument between anti-messianists (i.e., "mainstream" Chabad and the emissaries, led by Rabbi Yehuda Krinsky) and messianists is not about who is the messiah but over tactics – should we promote the Rebbe's messiahhood? The messianists do so even when it hurts fundraising. The anti-messianists do not. The bottom line is that all of Chabad is a messianic movement and its messiah is Menachem Mendel Schneerson, who was buried in a grave in Queens, New York 11 years ago. Chabad awaits his second coming with perfect faith – "Yechi adonaynu moreynu verabbaynu melech hamoshiach leolam voed!" – whether that declaration is made publicy or affirmed privately, in the end, the result is the same.